Bartacks and Singletrack: Tops, tops, tops. Three tops to share which have been made some time over the last couple of months and not yet made it to the blog. First up was a top for P who, with typical last minute timing, told me he needed a green top to wear to his lacrosse club team night. This must date back to June as it was made just before his birthday stencilled t-shirt. Same pattern: the Oliver + S School Bus T-Shirt. Same size 8 with crazy amount added to the sleeve length. 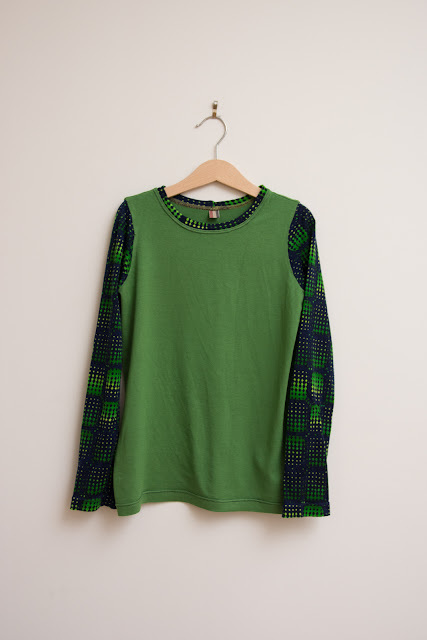 This time the sleeve length addition was limited by what was leftover of the green knit fabric from my Lisette dress. The solid green knit was in the stash and it's a great combination. 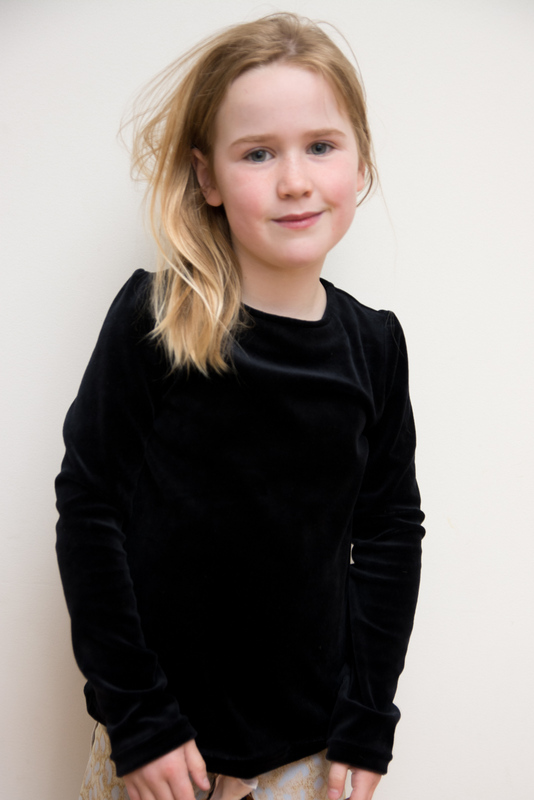 Then A needed a plain black long sleeved T-shirt for her school concert performance. 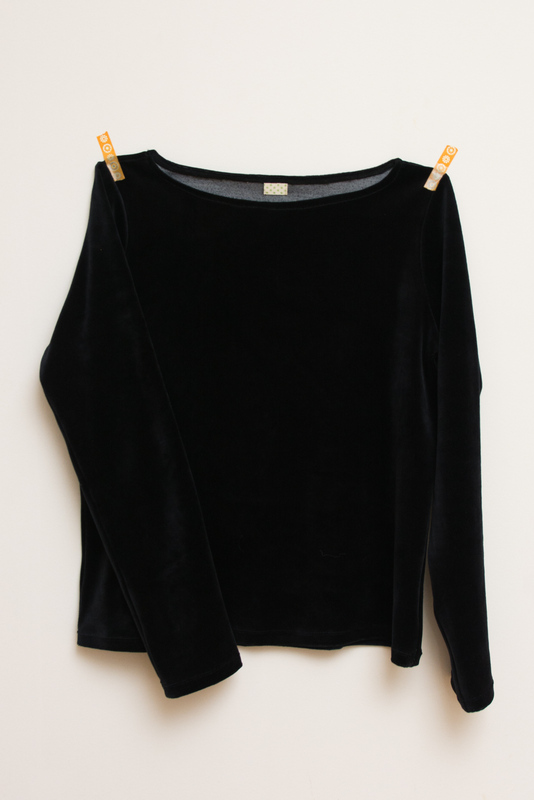 I had bought about 3 metres of this velour knit at ClearIt for just a few dollars a metre with no particular ideas in mind. I still can't decide if it's a very, very dark navy or a true black, but it fit the bill either way. My notes say I gave it about a 2&1/2" spread, but you can see that's still fairly subtle as far as puffy, gathered sleeves go. Notes also say it's a size 6 School Bus T-Shirt with size 7 body length and an extra 3" of sleeve length. 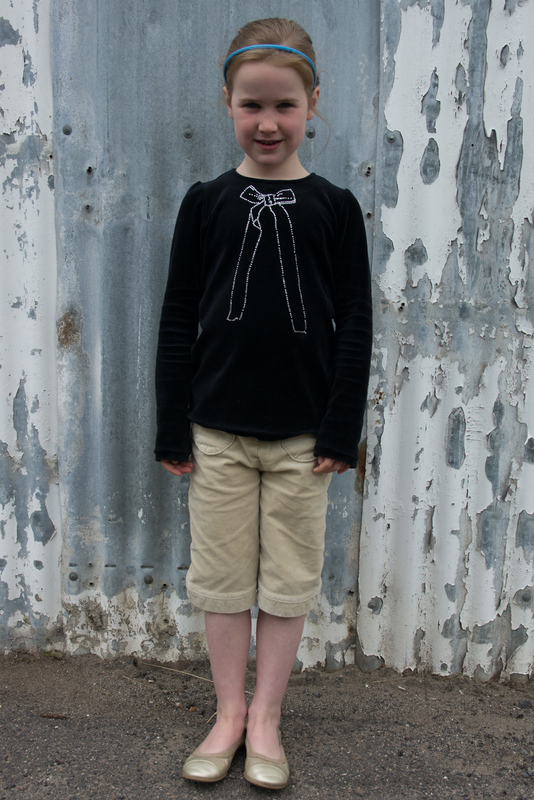 Ok, I probably overdid it on the sleeve length but I hate the way my kids outgrow their sleeves so quickly. The velour was never going to work well for a neckband so I did a facing with a cutout. I've used a thin hair elastic as the loop and A chose the button from the left-over lonely buttons pile. 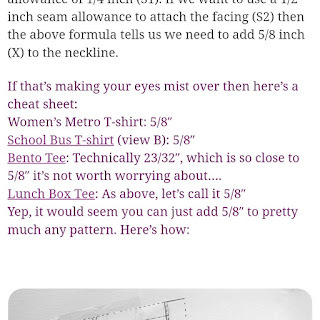 A couple of years ago now I wrote a tutorial for Oliver + S about how to do this to the Women's Metro T-shirt - I still wear my two versions of that top with the back neck cutouts all the time. I was delighted when I looked up my own tutorial to see that I had done the calculations required to do the same adjustment to the kid's School Bus pattern. Thanks past me! Then my mother in law spied A's top and said she's like one just like that too please. Well since I had just handed her a bag full of wool and some demands for knitwear I could hardly refuse. She turned up with a well loved Carla Zampatti velour top and requested one "just like that but without such long sleeves". 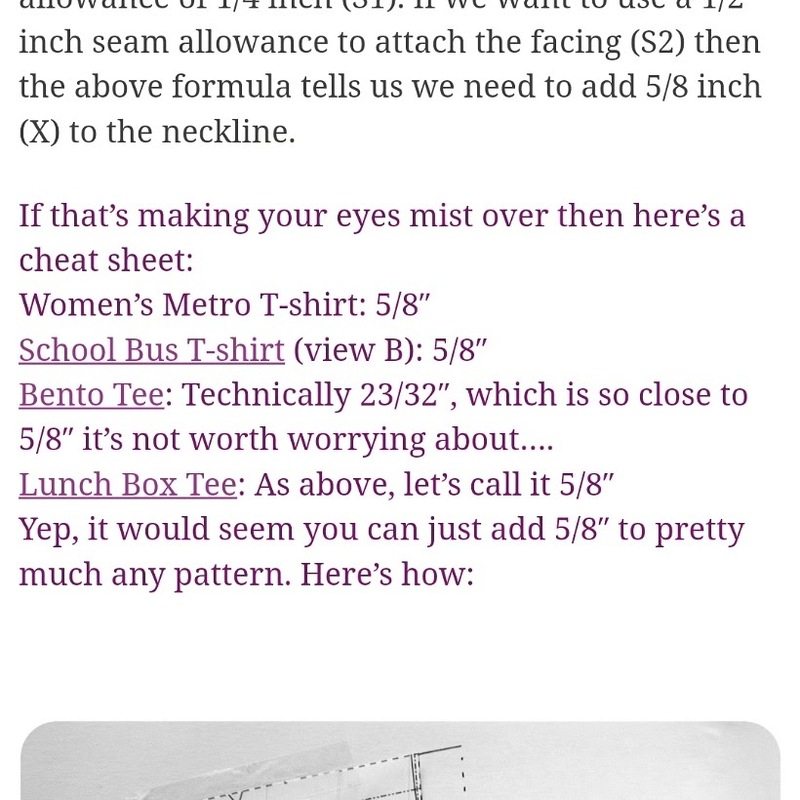 I pulled out my Metro T-Shirt pattern tracings and the XL seemed to perfectly fit the armscye and body lines. It was a good few inches longer in the body and had a different neckline but that was easily rectified. I traced the original Carla Zampatti T-shirts neckline then added the Metro T-Shirt below that. The neck is quite a bit higher at the front but is then turned over for a simple 1cm folded over hem and twin needle stitched down. The body and sleeves are exactly as per the Metro T-Shirt. The sleeves are plenty long, even on me, but still measured a good inch shorter than the original top. 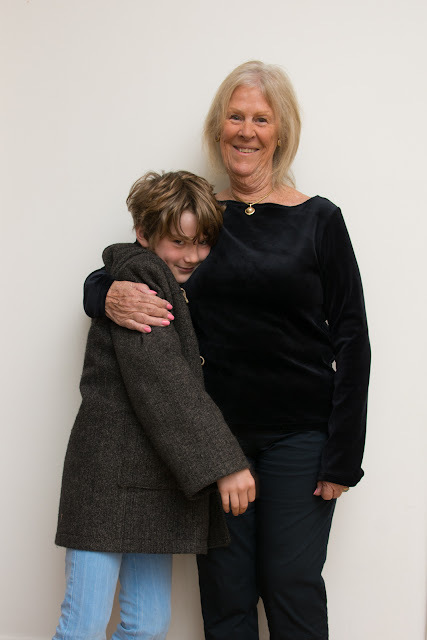 While the kids had happily told their granny I would make her a top, they'd neglected to mention the overarching rule that it would have to be modelled for a photo. Here she is, with P, being a good sport and wearing her Zampatti knock-off. I'd already cut A's top with the velour nap running upwards (looks lusher but you have to pat upwards!) and I was surprised to find that that was the same way that the designer label velour top was cut. So Granny's top is also cut with the nap running up. Almost immediately I'd finished cutting, I received an email alert from Marcy Tilton that they had a big stock of designer knit velour landing. The only trick to sewing velour, they said, was to always cut with the nap running down to avoid it getting snagged on chairs etc. 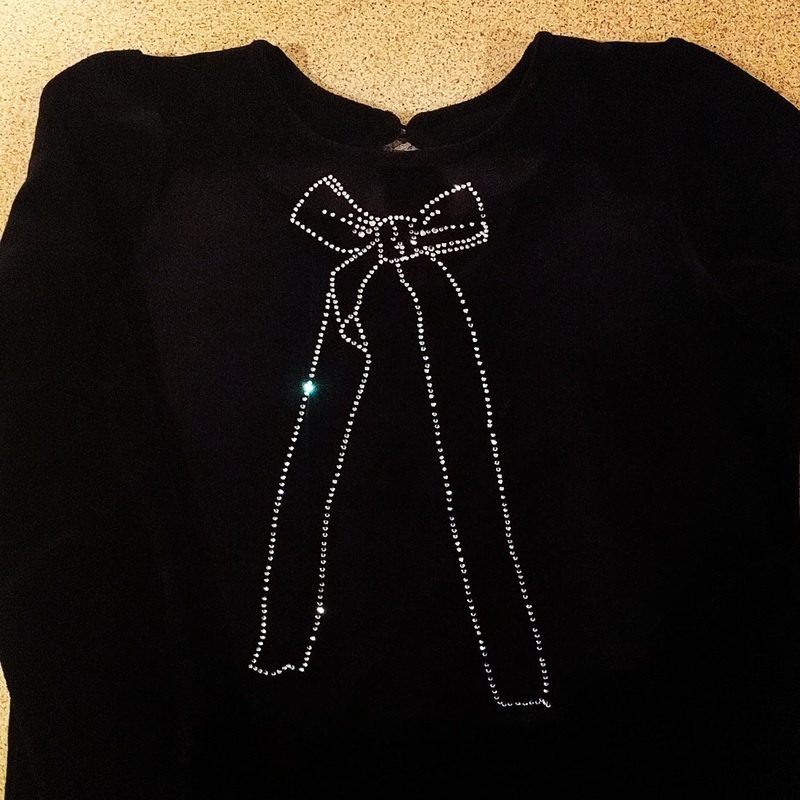 After the School Concert was over and the requirement for a "plain" black top had been fulfilled, we got out the bling! I've had this iron on transfer of diamantes from ClearIt for so long now, just waiting for a"plain black top" to put it on. It cost all of 50 cents and I now wish I'd bought a dozen of them. I was worried it would be hard to use, then worried it wouldn't stick to the velour. Tosh. 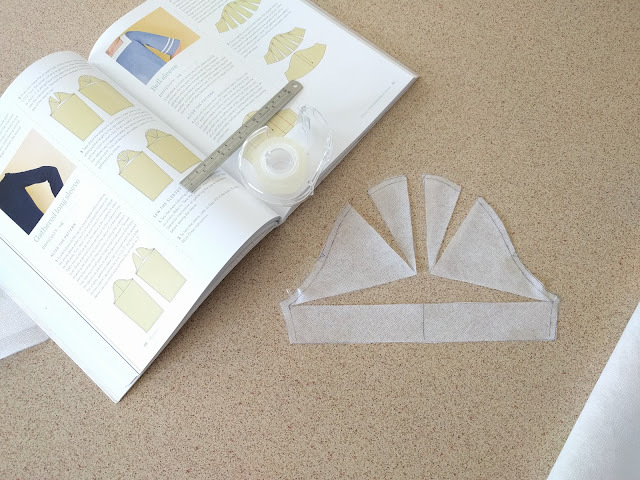 It was simply a matter of peeling off the paper backing, placing the transparent film with the diamantes sticky side down on the fabric, covering it with an ironing cloth, then heating the beejezus out of it. There were only two jewels in the centre of the bow that didn't stick first time and I replaced the stencil and ironed again. I'm happy to say it has already been through the wash twice (inside out) and is looking like it will last perfectly. Should have bought a hiundred of them. This is now one of my favourite all time makes for the girl. 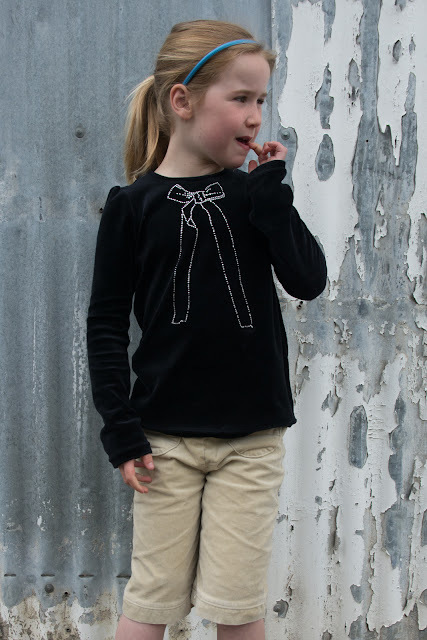 Amazing how a simple T-shirt can look when you zoosh up the design lines, use some lush fabric and then stick some jewels on it! If you follow me on Instagram you already know who scored the rest of that 3m cut of velour.... I'll show you the results of that next time. Great t-shirts for mum and daughter. Well done with the velour, it does look lush. And I love the green one too.